D) A total disregard for player safety. This is a heck of a stadium, looking more like it’s meant for football than baseball. It somewhat calls to mind how Yankee Stadium looked like in it’s earliest days, or perhaps even more accurately the Polo Grounds early in it’s tenure. There’s a lot of LA Coliseum and Rose Bowl in there too. 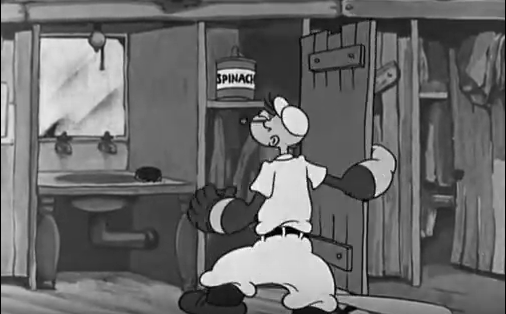 Now, the use of spinach is a controversial part of Popeye lore. While arguably his most iconic trait, there has long been the problem that spinach, while good for you, is nowhere near the super-food that Popeye depicts it as. While this could usually be chalked up to the fact that it’s a freaking cartoon, the story goes that this was a result of a typo by a German scientist that made it look like spinach had ten times as much iron as it actually did. However, others say that the amount of iron has never had anything to do with why Popeye ate spinach, and that it was based on Vitamin A alone. 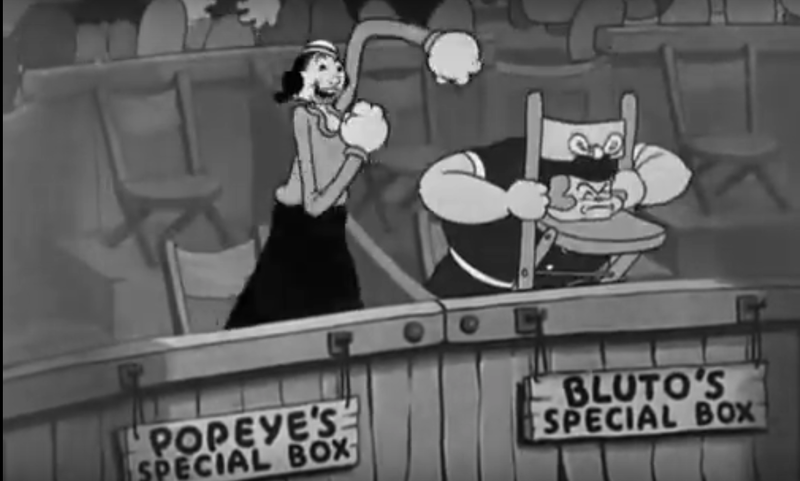 Either way, though, there is also the troubling fact that Popeye’s use of spinach is often shown in a manner that suggests it, in the Popeye universe, is a performance-enhancing drug. It is a deus ex machina that automatically makes the sailor stronger, faster, and often grants him remarkable powers. When fighting evil, this seems all well and good, but in a sporting event it seems… unsporting. And selfish, really. I mean, remember Dash Dartwell and how he used his powers to not save his teammates, but rather play in a game and only save the ballplayers after the game? 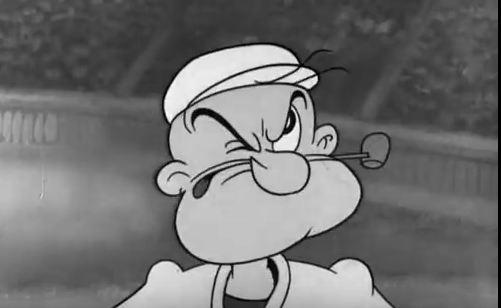 Popeye is really no different here if he intends to use his super-spinach to win a ballgame, as opposed to, like, I dunno, stopping a bank robbery or flying over to Europe and beating up Nazis. 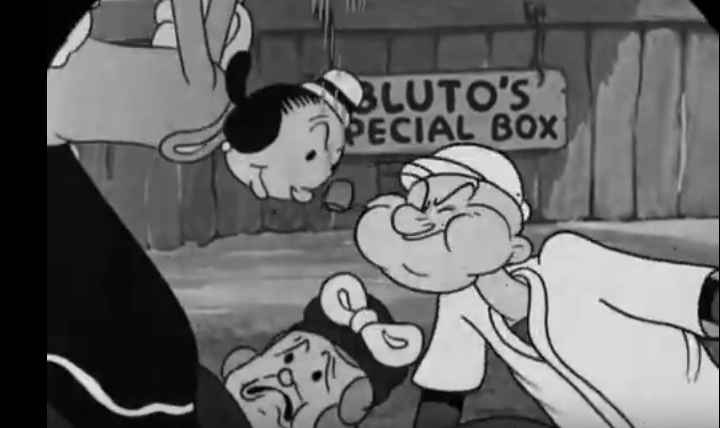 Wow, Olive Oyl has put a chair over Bluto’s girlfriend’s head. Wow. 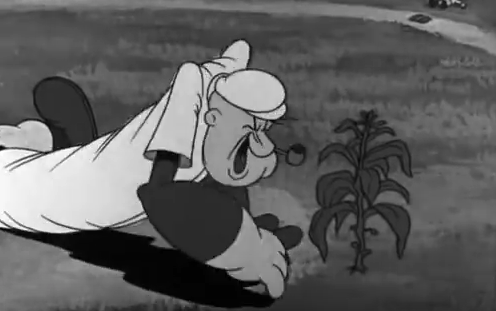 He then gives the (now grass) spinach back to Popeye, who thinks it’s just being a good sportsman. 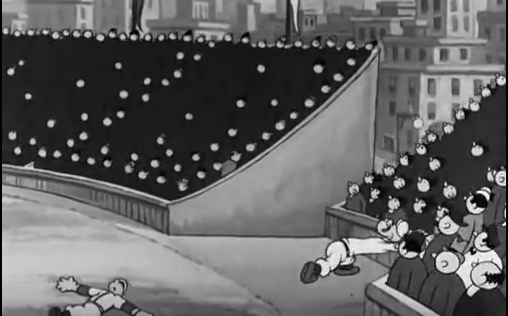 The second pitch causes Popeye to spiral and spin so much he is briefly transformed into a picket fence’s gate. The third pitch is literally lightning fast. 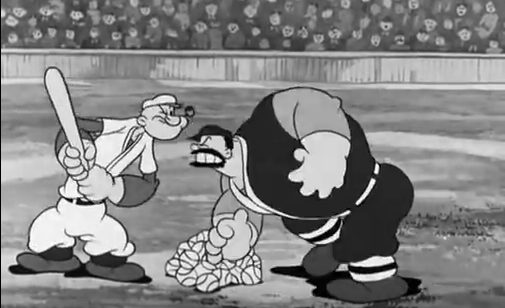 So now, in the bottom of the 1st, Popeye takes the mound. 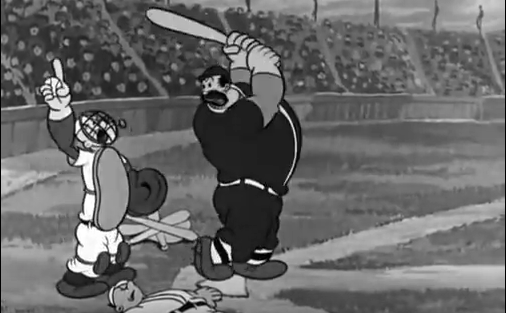 However, Popeye still goes about and decides to pitch anyway, thinking he’s got his spinach-strength. 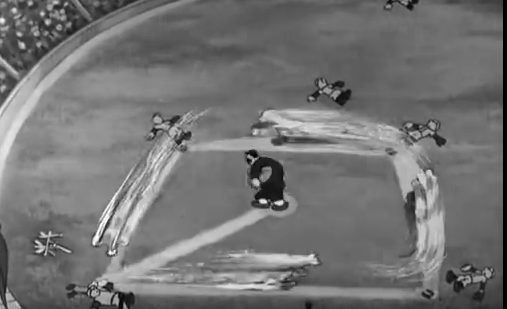 Bluto promptly hits a grand slam. Now, a few problems here. 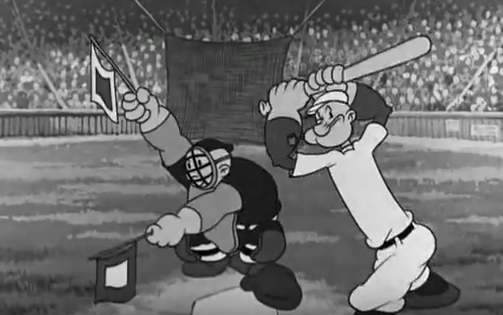 The way the game began, with Popeye batting first, would suggest that he was the away team. 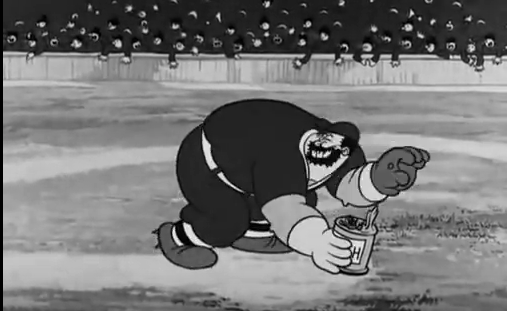 However, here we see Bluto listed first, suggesting he is the away team. 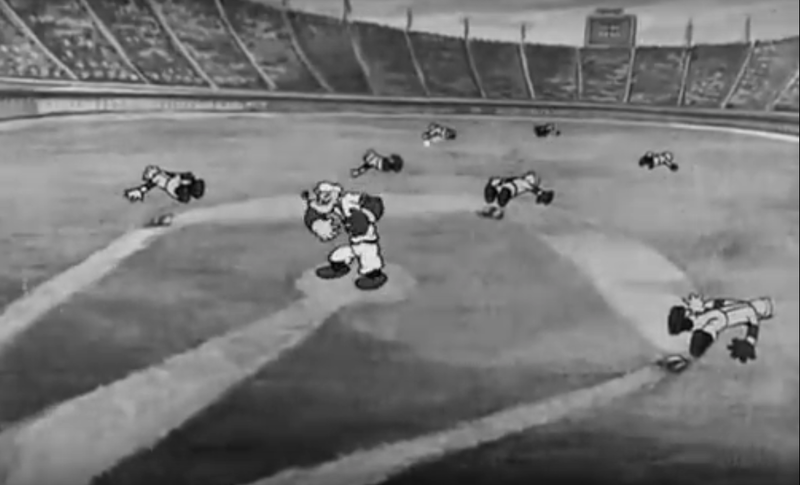 And yet still, Popeye is shown to be batting presumably meaning either he is the away team again OR it is the bottom of the 9th. 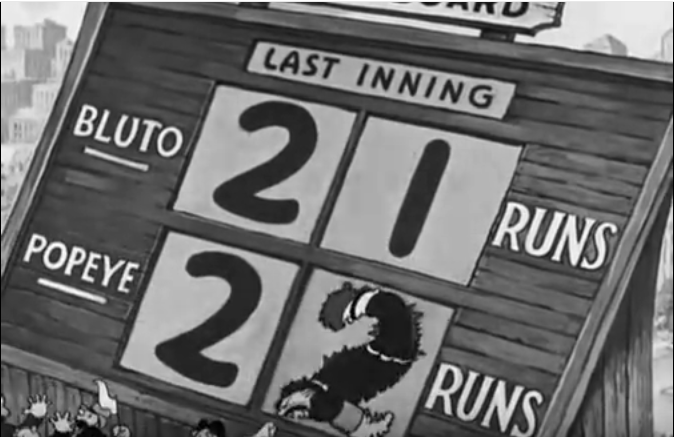 Either way, however, the game should be over after Bluto strikes out Popeye to seemingly end the inning using various cartoony pitches…. 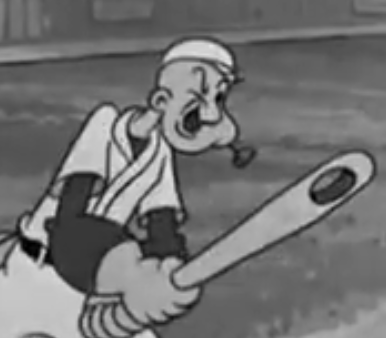 and yet Popeye still takes the mound. Absolutely nothing is said or done about this. I mean, if there were 8 unconscious people on the field, you’d think there would be, like, a stoppage of play or something. But, nope. Oh well, it’s just a show, I should should really just relax. 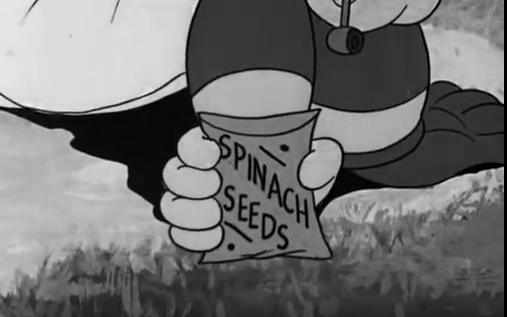 Oh, and at this point, Popeye takes out his ace-in-the-hole: spinach… seeds. And, again, there are eight unconscious people around as this happens. Man, that’s kind of a dark finish. I mean, beating somebody up and forcing them to recite your boyfriend’s theme song? 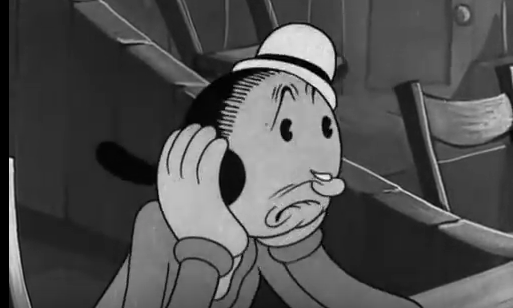 Man, Olive Oyl, that’s dark. So anyway, what can we glean and learn from this piece of Bizarre Baseball Culture? 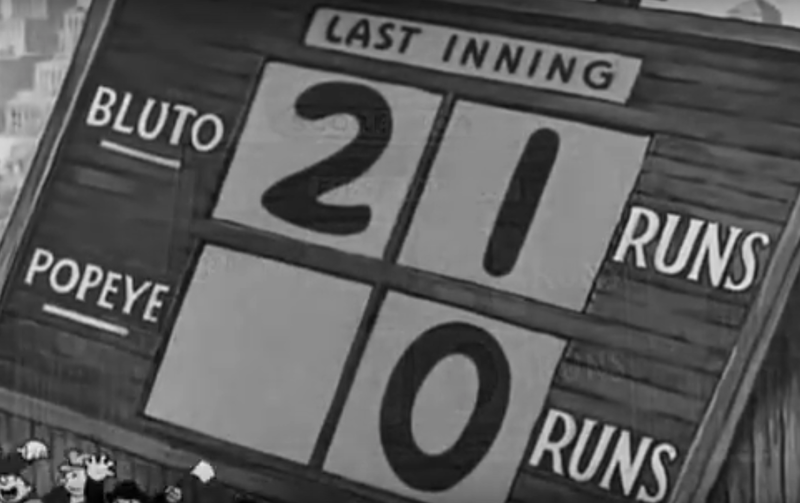 Well, we learned that the rules of baseball are malleable, that having your entire team be unconscious is not a cause of concern, and that eating super-drugs (or spinach) in order to win a game is a-okay. Also, violence is fine if it means you are going to win or have just won that game. So… nothing. We learned nothing. 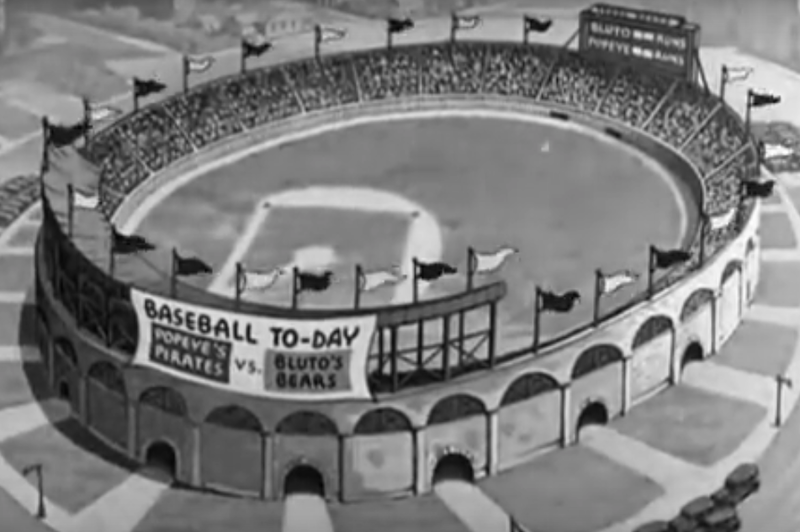 This entry was posted in Baseball, Misc., Movies, TV and such, Uncategorized and tagged baseball, Baseball cartoon, Bizarre Baseball Culture, Bluto, cartoon, Olive Oyl, Popeye, Popeye the Sailor, Popeye the Sailor Man, Popeye the Sailorman, Spinach, Sports, toot toot by danglickman. Bookmark the permalink. This is absolutely brilliant … and your play-by-play recap is better than actually watching the cartoon itself! I can only hope Wimpy was out in the stands somewhere sneaking hamburgers out of vendor carts.